The Jameh Mosque is the third World Heritage Site in the beautiful city of Esfahan (Meidan Emam en Sotun Palace (part of the The Persian Garden World Heritage Site) are the other ones). The mosque is one of the oldest in Iran, with architecture from the last 12 ages. 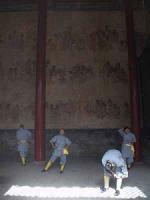 Walking through the enormous complex you can see a lot of different styles. You can find old brick halls but also beautiful fine mosaics. This is definitely a mosque where you can explore for a long time. All over Iran you can find beautiful gardens. Nine of them are inscribed on the list and I visited six of them. To fully appreciate it, you should visit the gardens not in wintertime, which unfortunately I did. Most of the fountains in the gardens won't have water in it and the trees are mostly without leaves and there will barely be any flowers. I did enjoy them nonetheless. 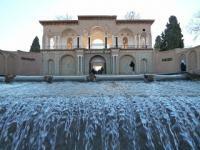 I first visited Bagh-e Eram in Shiraz. There was no water in the canals but the turquoise pond in front of the beautiful Eram palace and the surrounding palm trees from the Canary Islands were lovely. 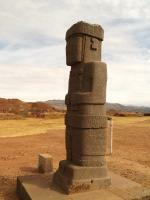 Tiwanaku (Tiahuanaco) is a complex of buildings, temples and a pyramid from pre-Inca times and is therefore Bolivia's most important archeological site. 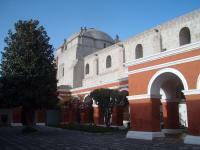 The site consists of two museums and the archeological grounds with the buildings. One museum hosts mostly ceramic artifacts and the other one only hosted one sculpture by the time I visited it (June 2008). More artifacts and sculptures will be brought from the archeological site to the museums in the near future for preservation.